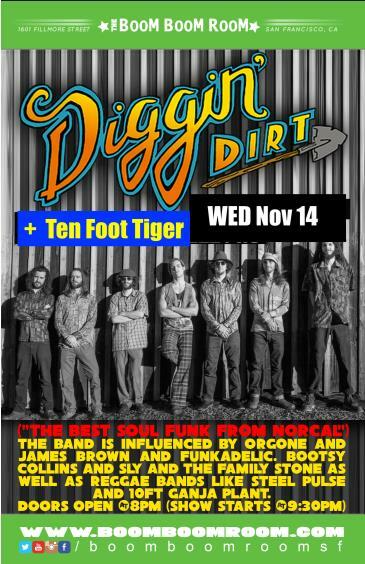 Diggin Dirt + Ten Foot Tiger "Second Wednesdays Monthly"
began planting its roots back in 2011 in the town of Arcata, CA in Humboldt County. The newly conglomerated 8-piece band had instant chemistry, and after only a few months of playing together, released their Full Season LP. 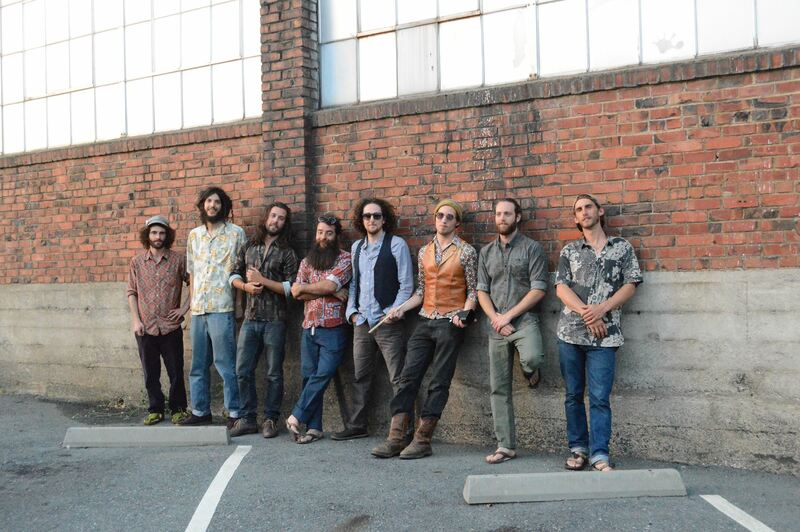 Their debut album is comprised of 11 tracks that showcase musical influences ranging from afrobeat, reggae to rock, but always with an underlying theme of funky soul. 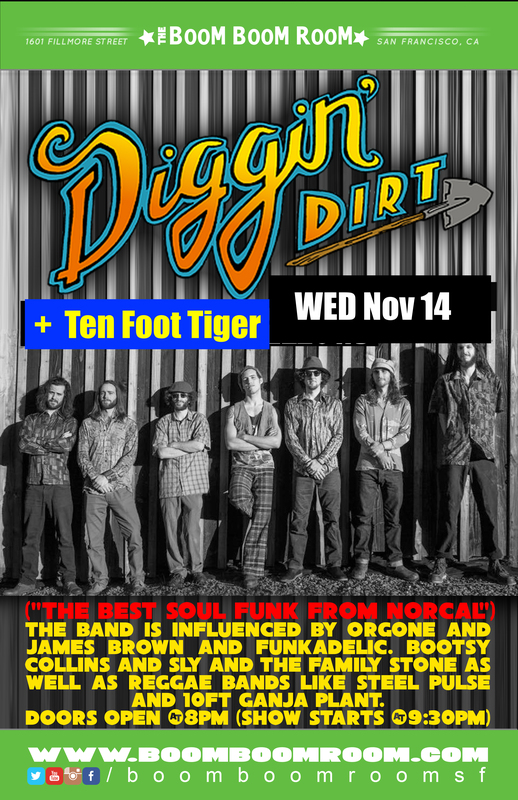 The Dirt is more inspired than ever, and ready to bring the music to the people. With more expansive West Coast tour dates, and fresh material coming out of their preparations, the group shows no signs of slowing down as they expand their reach. Earn that paycheck, and dust off those dancing shoes because we’re looking at you tonight! Keep checking in on this funky force, and make sure to come out and groove at BooM BooM RooM on the 2nd Wednesday of Every Month. 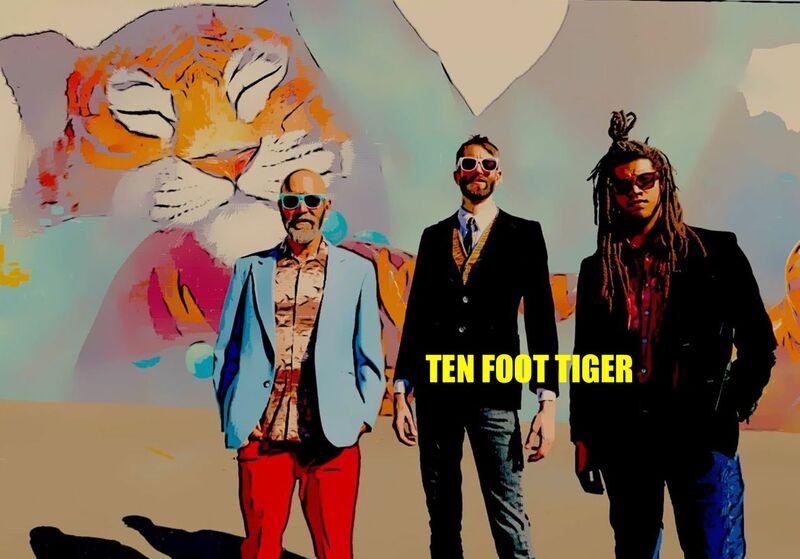 Ten Foot Tiger is a collective of musicians driven solely by the desire to play music. Poignant and provocative songs, powerful improvisations and exhilarating live performances makes this project a must see for any music lover. SUPER AMAZING FUNKY NIGHT OUT at BooM BooM RooM !